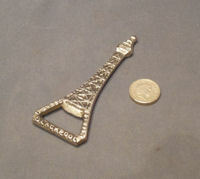 Original, quality chrome on steel 'crown cap' bottle opener in the form of the Blackpool Tower. One side is embossed 'Blackpool Tower' and the other with the registration number for the year 1945. An unusual tourist souvenir and complete and in good and working order. 4.25" x 1.75". Original, quality late 19th century double lever corkscrew in the original bronzed finish. The butterfly grip is impressed "A1" and "Heeleys Double Lever". 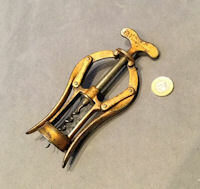 This model was patented in 1880 is one of the easiest action corkpullers to use my opinion. Fully overhauled and complete and in good and working order. 6.5" x 3" x 1.5". 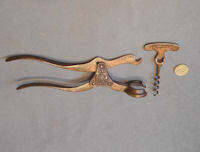 Original, quality late 19th century patent continuous action steel corkscrew of a similar principle to the "Challenge Patent". Scuffs to the nickel plating but otherwise complete and in good and working order. 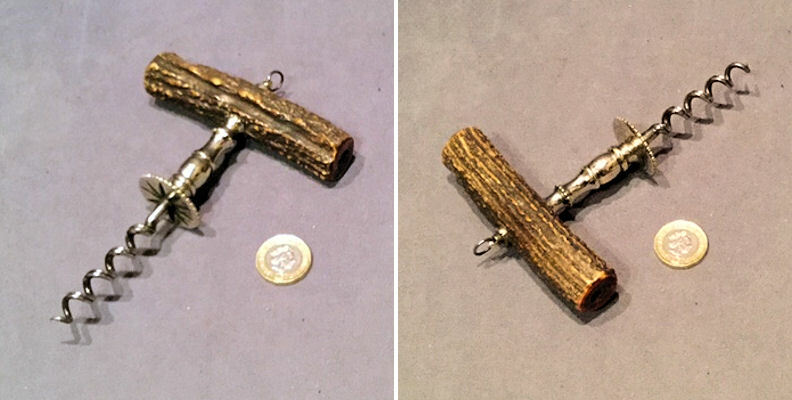 5.75" long x 2.75" wide. 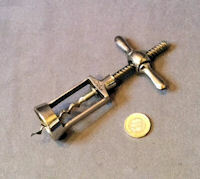 Original, quality 1920's nickel plated on steel patent corkscrew, marked "The Challenge". Complete and in good and working order. 6" long x 3" wide. 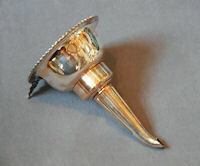 Original, quality 1920's cast brass corkscrew with a shaped wingnut turn screw to the top. 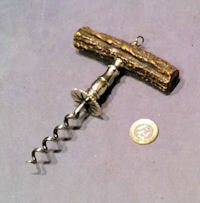 This super example is a longer version of a more common corkscrew manufactured by Farrow and Jackson. 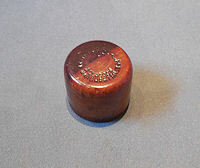 This example is not marked with any manufacturer's details but is in superb condition with a good smooth action. Fully overhauled, polished and lacquered, although the lacquer may be removed at no extra cost and complete and in good and working order. Total 8" long, 2.75" wingnut and steel helix 3". 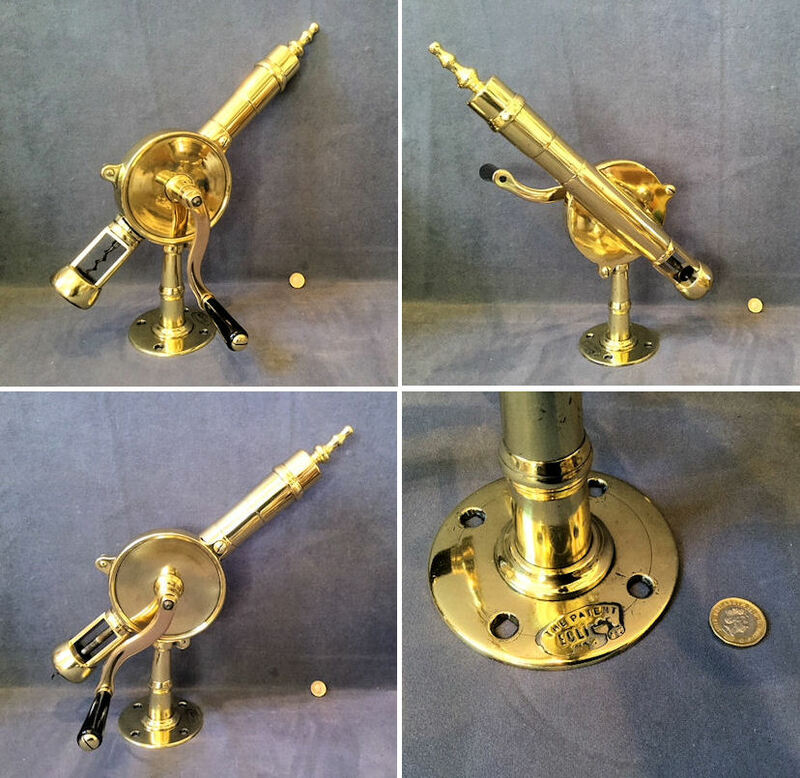 Original, quality, cast brass 'Rotary Eclipse' bar corkpuller, circa 1900 / 1920's, undoubtedly the finest of the bar corkpullers ever manufactured. One wind of the handle, clockwise, will turn the screw into the cork and another turn, anti-clockwise, will draw the cork from the bottle with no effort. The circular base has four countersunk screw holes for mounting to the bar and the cranked side handle has a cylindrical ebony grip. The base also has the remains of the manufacturer's plaque detailing "The Patent Eclipse". Polished and lacquered, although the lacquer may be removed at no extra cost. We rarely find these today and this example, fully overhauled, is complete and in good and working order. Base 4.5" diam, total 16" tall x 7.5" wide including handle and 13" front to back. 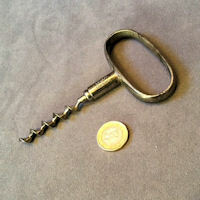 Original, quality, circa 1900, steel ring grip corkscrew impressed "Farrow & Jackson London". Cleaned and lacquered and complete and in good and working order. Total length 5" and 3" wide. 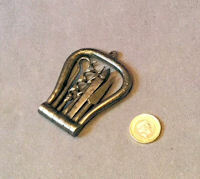 Original, quality, circa 1900, cast corkscrew of the Hercules style but not marked as such. This example has the top spring to the neck and a stained beech handle. Cleaned and lacquered and complete and in good and working order. 6.5" x 3.5" x 1.25". 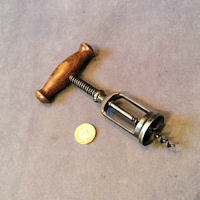 Original, quality late 19th century corkscrew with a nickel stem with a button beneath, a double wire helix and a good chunky antler horn handgrip. 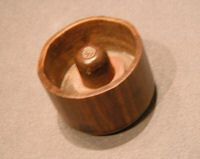 The top has a small steel ring and all has been cleaned and waxed and is complete and in good and working order. Handle 4" x 0.75" and length 6". 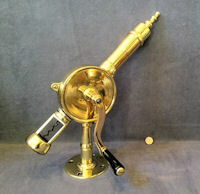 Original, quality late 19th century two piece patent cork puller in the original bronzed finish. This example is embossed "Lund Patentee 24 Fleet St and 57 Cornhill London" to the lever and "London Patent" to the corkscrew. All is complete and in good and working order. Lever 8.5" x 3" x 1.5" and corkscrew 4.25" x 2".